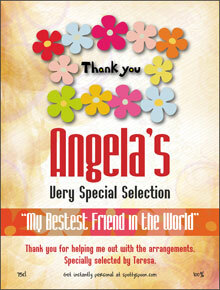 A Thank You Gift Wine Label. 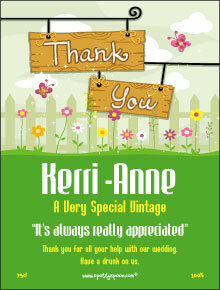 Perfect when you need more than just a card...thank them with a personalised wine bottle. Thank you for helping me out with the burst water pipes. Specially selected by neighbour Mark. Want to thank someone special for doing you a big favour or helping you out when you needed them? 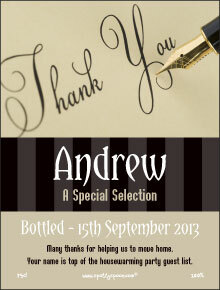 Create a personalised gift wine with this 'Thank You' wine label. Simply fill in what you want to say to the person and either download it for printing at home or we can quickly post it to you as a peel & stick label which can be placed on a wine bottle of your choice. Much more personal than just a card or plain gift. This really will make them feel appreciated. Note - good phrases that describe helpful people and wine are 'a very special selection', 'appreciated by all', 'much loved', 'with an excellent character' 'an ever dependable choice' etc. Easy to use website. Good value and fast efficient service. Received my labels within 3 days of ordering. Easy to stick on my wine bottles & my friends all loved their unique gifts. Excellent product. Easy to order and speedy delivery. My colleagues loved their personalised wine! !